*All info is being moved to RedDoorStudiosKC.com. This page will eventually be removed. Would you like to develop your art at your own pace, or do you have long term goals that cannot be accommodated in a single class? Does your teen have a keen interest in drawing or painting, or is considering art school? 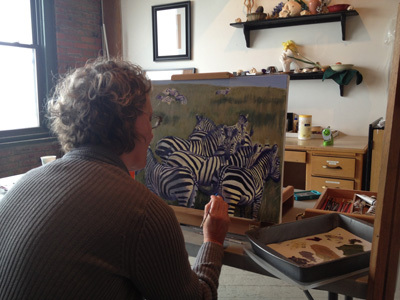 I offer private drawing lessons and painting lessons at Red Door Studios or in your home in Kansas City, MO, Kansas City, KS, Johnson County, KS, and the surrounding areas. I've helped people "who couldn't draw a stick figure" surprise themselves with their new found abilities, helped more experienced artists advance their skills, and have helped teens develop strong college portfolios. I develop a curriculum that is tailored to fit the interests and ability level of the student. Using many traditional and modern methods of teaching, I help students learn how to see, analyze what they see, and then draw and paint according to their vision. I understand that everyone has a different way that they learn best, and am able to present concepts using several different approaches according to the personality of the individual. Students work from both 2D and 3D references as appropriate, including still lives, models, master drawings, plaster casts, Bargue plates, and photographs. Generally, it is preferred to begin with a strong foundation in drawing before moving onto painting or other media that incorporates color, but this is flexible. 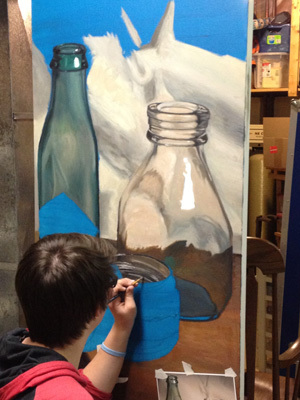 A student works on an oil painting at Lacey's studio. While I have experience teaching people of all ages, I currently specialize in working with teens and adults. Drawing students usually meet 1hr per week, with advanced drawing and painting students often requiring a 1.5 or 2hr meeting each week. Some students prefer to meet only twice per month; the duration and frequency of meeting is adjustable according to the student's needs. Semi-private lessons (where more than one student shares the lesson time and the fee is divided) are also available by request. Benefit from my studio environment with controlled lighting and life-drawing props. Work in your own space at your own convenience. Great for students who cannot make it to the studio. Learn from anywhere with no travel fees! Lacey is also available to teach workshops and classes. Contact Lacey if you are interested in hosting a workshop or series of classes, or if you would like to be notified of workshops and classes as they are scheduled.